There was a time long ago when I was not much older than my players, about eight years when I started. The relationship was more like an older brother than an authority figure. It had some advantages. Parents had lower expectations of a young coach, figuring someone that young with minimum experience was excused from doing or saying things more, shall we say, mature adults might not. Credibility wasn’t an issue; I didn’t have any. The age gap between me and my first junior club players was about the same as those early years coaching pee wee and bantam. The difference, however, was that junior guys know and have done more. A lot more. Their expectations (and the club’s) dwarfed anything I’d faced. We call it naiveté and I was awash in it. So while I had some respectable beginner coaching skills, I had to learn about the culture of working in an elite environment. My age wasn’t the issue; my ability to relate to these players nearly was. Credibility didn’t matter much if I could get the job done for them. For a while, I wanted to be older. In Europe, my club had four players older than me. All had been on the country’s national team, a point of pride for them that I never quite appreciated. This was because, relative to Canada, their national team was pretty poor. They figured they had the playing chops while their Canadian coach, who was okay as a coach, just didn’t get it. How could he not? Well, they were a bit arrogant about it. Even their teammates said so. But the point was made. 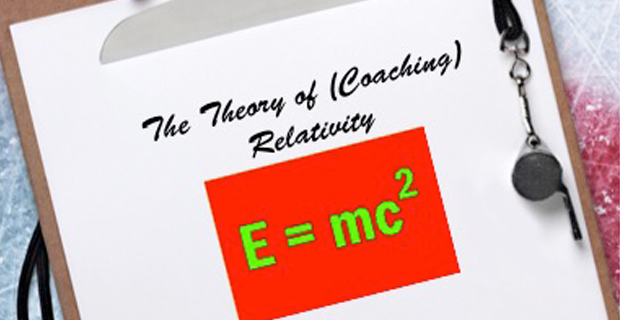 A coach needs to understand relativity in every situation. As an assistant in college hockey, I successfully widened the age gap between me and the guys, which actually helped. Someone over 30 had to know what he was doing, didn’t he? While coaching elite bantam and midget teams and being in Canada’s Program of Excellence, I discovered I’d have been hard pressed to get as much out of it as I did were I not relatively much older than the players. Experience now counted and being old enough to be players’ parents meant I had probably developed enough life skills to get by (though I always wondered what specific life skills counted or didn’t!). Then a peculiar thing happened. I grew older than my players’ parents. Now suddenly the ability to relate to players as I’d managed in a previous epoch no longer existed. I had to start all over again because, really, I’d begun to lose touch with that generation. The same work I had to apply to develop credibility now needed to be channeled into re-learning communication skills I’d long since taken for granted. Einstein sort of had it right. The energy (e) it takes to coach equals (=) most of your life experiences (m) multiplied by your coaching competencies (c) on top of each other (squared). Seems simple enough. Relatively speaking.